The Big Book of Soul’s story begins about 10 years ago when I had an idea for an herbal beauty guide. It was to be called “Down Home Beauty: an Herbal Guide for Women of Color.” I connected with agent Marie Brown through my book proposal for Down Home Beauty one of the highlights of my writing career. She is a terrific agent yet try as we might, we could not find a mainstream publisher in the New York publishing scene who would publish Down Home Beauty, even after trying multiple and I do mean multiple submissions. Cut to 5 years later, the year of 2005. I wrote another broader based herbal called Earth Mother Herbal. This book was a passionate outpouring—an in-depth herbal guide for and about people of African descent also focused around African trees and plant remedies. At a little over 750 pages, it was a hard sell any type of publisher. At that point in my career, I had decided niche publishers were the way to go but they too thought the tome was too much. It was under contract with a publisher but after several rounds of peer reviews they refused to publish it. I could tell that the spirit and style of the book didn’t mesh with the mission of that particular publisher so I wasn’t heart broken—I knew eventually I’d find the right home for Earth Mother Herbal. I decided to shop it around to small, independent, niche publishers. Eventually, I found a publisher but they thought it was way too long. One brilliant editor suggested I either break it in half or take one of its subjects and make a book out of it since it was so broad. Before I knew it Earth Mother Herbal morphed and changed to become 2 separate books. The first was A Healing Grove: African Tree Remedies and Rituals for Body and Spirit, which was published by an African American imprint of Chicago Review Press called Lawrence Hill Books, last year. A Healing Grove grew out of one of the many subjects I had in Earth Mother Herbal—the African use of Motherland trees. I was glad that A Healing Grove had found a home with an African American specialty press. Then my recent book, The Big Book of Soul, went to Hampton Roads Publishers a mind, body, spiritual health publisher. This book’s editor was originally interested in acquiring my very first published book, “Sticks, Stones, Roots and Bones” and wanted to see what I was working on currently. Interestingly enough the first book I wrote, Down Home Beauty from the year of 2000 also makes an appearance in The Big Book of Soul, in several chapters focused around health and beauty. The publication of The Big Book of Soul is a testament to perseverance. Try, try, try again as Ma would say. It demonstrates a passionate belief in the creative process, daily writing practice and a dedication to an idea. “The Big Book of Soul” demonstrates the importance of flexibility on behalf of the author, good contacts and taking in great advice. Stephanie Rose Bird, is the author of five books: The Big Book of Soul: the Ultimate Guide to the African American Spirit: Legends and Lore, Music and Mysticism and Recipes and Rituals, (2010, Hampton Road Publishers), A Healing Grove: African Tree Medicine, Remedies and Rituals ( 2009, Chicago Review Press), Light, Bright, Damn Near White: Biracial and Triracial Culture in America and Beyond (2009, Praeger Press/Greenwood Publishers) Sticks, Stones, Roots and Bones Hoodoo, Mojo and Conjuring with Herbs (June 2004, by Llewellyn Worldwide) and Four Seasons of Mojo: An Herbal Guide to Natural Living (Llewellyn Worldwide, 2006). 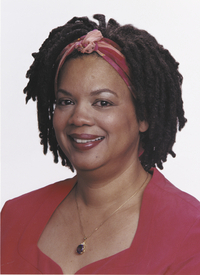 Bird has published numerous articles and columns including “Sage Woman,” www.naturallycurly.com, “Witchvox,” “PanGaia” and the “Oracle.” She is the mother of four, married to her soul mate and companion to four feisty animals. Bird teaches magickal Herbalism, painting and herb crafting as well as aromatherapy. She lives and works in the Chicago area. You can reach her at www.stephanierosebird.com or at www.authorsden.com/stephanierosebird. I love this book cover. Its colorful and inviting.